NEW YORK (AP) — After an hour of fielding questions about Syria, sanctions and nuclear weapons, Iranian President Mahmoud Ahmadinejad had enough. Now, he said, it was his turn to choose the topic — his "new order" which will inevitably replace the current era of what he called U.S. bullying. Continuing his hectic pace of media appearances and diplomatic meetings, Ahmadinejad presented an air of boredom when it came to the hot topic on everyone's mind — Iran's nuclear program and the possibility of impending war. Whether it was feigned or sincere, he said he would much rather be talking about his vision of what the next world order might be. "God willing, a new order will come and will do away with ... everything that distances us," Ahmadinejad told The Associated Press in an interview Tuesday, speaking through a translator. "All of the animosity, all of the lack of sincerity will come to an end. It will institute fairness and justice." "Now even elementary school kids throughout the world have understood that the United States government is following an international policy of bullying," he said. "I do believe the system of empires has reached the end of the road. The world can no longer see an emperor commanding it." 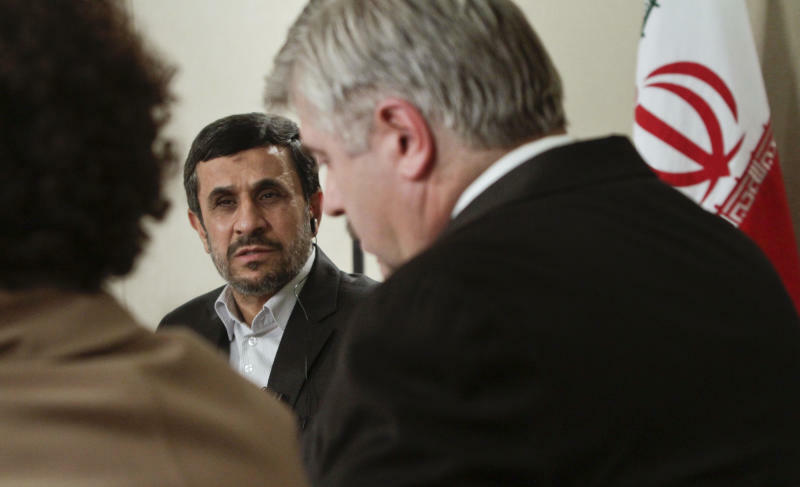 The interview was held on the sidelines of the U.N. General Assembly — Ahmadinejad's last as president of Iran. He was to address the assembly Wednesday morning. He also discussed solutions for the Syrian civil war, dismissed the question of Iran's nuclear ambition and claimed that despite Western sanctions his country is better off than it was when he took office in 2005. 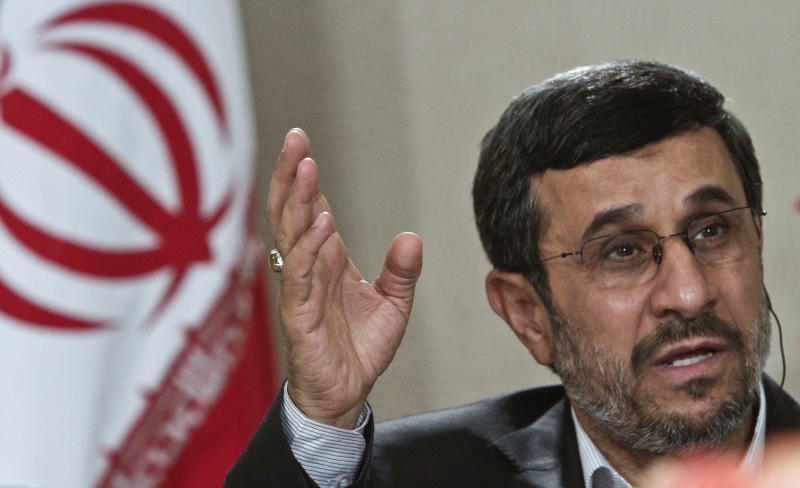 Ahmadinejad would not respond directly to the president's remarks, saying he did not want to influence the U.S. presidential election in November. But he argued that the international outcry over Iran's nuclear enrichment program was just an excuse by the West to dominate his country. He claimed that the United States has never accepted Iran's choice of government after the 1979 Islamic revolution. "Everyone is aware the nuclear issue is the imposition of the will of the United States," he said. "I see the nuclear issue as a non-issue. It has become a form of one-upmanship." "Of course I am not dismissing such talks," he said, asked if he were open to discussions with the winner of the American presidential election. Ahmadinejad also proposed forming a new group of 10 or 11 countries to work to end the 18-month Syrian civil war. Representatives of nations in the Middle East and elsewhere would meet in New York "very soon," he said. "I will do everything in my power to create stability, peace and understanding in Syria," Ahmadinejad said, adding that he last spoke with Assad one year ago over the telephone. 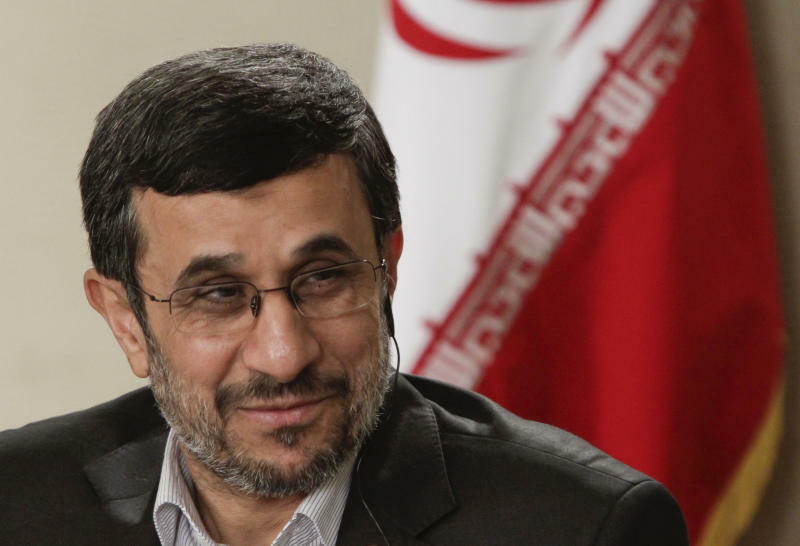 Ahmadinejad will leave office next June after serving two four-year terms. He threw out numbers and statistics during the interview to show that Iran's economy and the lives of average Iranians have improved under his watch. Since his 2005 election, he claimed, Iran went from being the world's 22nd-largest economy to the 17th-largest; non-petroleum related exports increased sevenfold; and the basic production of goods has doubled. Median income increased by $4,000, he said. "Today's conditions in Iran are completely different to where they were seven years ago in the economy, in technical achievement, in scientific know-how," Ahmadinejad said. "All of these achievements, though, have been reached under conditions in which we were brought under heavy sanctions." It was not possible to immediately verify most of Ahmadinejad's figures and claims. The CIA's World Factbook says Iran was the world's 18th largest economy last year, as measured by its gross domestic product. It said Iran's "GDP growth remains stagnant" and that the country "continues to suffer from double-digit unemployment and underemployment." But the Factbook credited Ahmadinejad with spearheading a law to reduce state subsidies that drained the budget and mostly benefited Iran's upper and middle classes. He also claimed never to have heard of Amir Hekmati, a former U.S. Marine who is imprisoned on espionage charges in Iran. Hekmati was arrested while visiting his grandmothers in Iran in August 2011, and his family has been using Ahmadinejad's visit to New York to plead for his release. In spite of Ahmadinejad's assertions on the importance of dialogue and respect for others, he has presented a hard line in many areas in this week's media appearances. He refuses to speak of the state of Israel by name and instead refers only to the "Zionists." And when asked on Monday about author Salman Rushdie, he made no attempt to distance himself from recent renewed threats on the author's life emanating from an Iranian semi-official religious foundation. "If he is in the U.S.," said the president of Iran, "you should not broadcast it for his own safety."